Policy is at the heart of any government service, but complex policy shouldn't necessarily mean a complex service for users. We're part of the Digital Service team for the Immigration Health Surcharge (IHS), a new step in the visa application process at UK Visas and Immigration. Users applying for or extending their UK visas for more than six months need to make an extra payment towards the cost of their healthcare while in the UK. The change has affected temporary migrants coming to work, study or join family in the UK since 6 April 2015. It's a long list of questions based on the 15 different criteria for exemptions, and it uses language that might be difficult to understand. We did some user research and noticed plenty of problems with the way the form looked. Our users, some of who don't have English as their first language, were confused by the long questions. That meant that they would often accidentally identify themselves as exempt from the IHS. This in turn could mean that their visa applications might be refused. Working with our policy stakeholders, we felt we could improve the exemption part of the IHS service. To start, we challenged the assumption that all users would be using the IHS service. 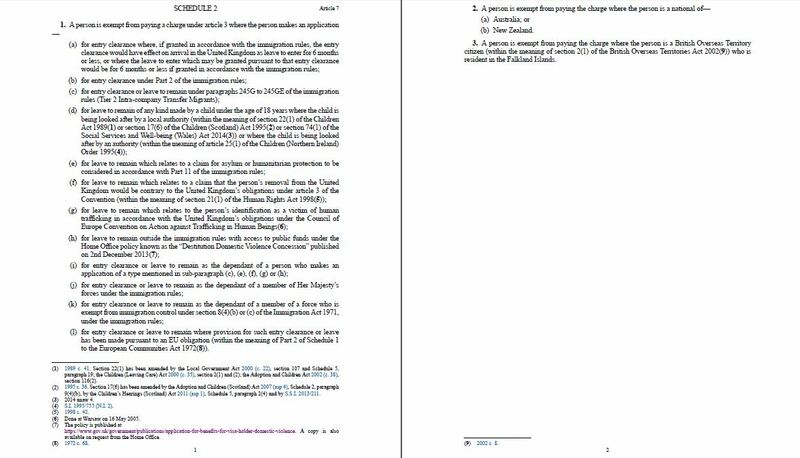 For example, victims of human trafficking are one group of users exempt from the IHS. When a victim of human trafficking applies for a visa to stay in the UK, they are always referred directly to the Home Office and the IHS fee is waived. Similarly, users who are applying through the Destitution Domestic Violence Concession (people in the UK on a visa as someone's partner, where their relationships have broken down because of domestic violence and they don't have the money to support themselves), do so using a different, paper-based form. For other users exempt from the IHS, we could infer their exemption status from the types of visas they applied for. 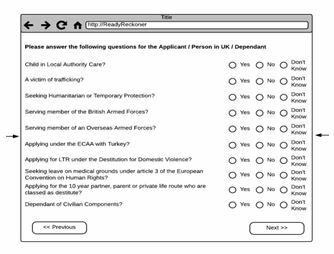 For example, users eligible for the armed forces exemption would always apply through an armed forces visa route. We did the same based on the user's nationality. Users from New Zealand and Australia are automatically exempt, so we changed the prototype service so that if a user told us that they are from one of those countries, we don't have to ask them about exemptions again. The final exemption criterion only applies to children in the care of a local authority. We can't infer this data from any other information they've entered into the service, but we made a change to the form so that only users under 18 will see it. We've also rephrased the question to make it easier to understand based on user research findings. We've been able to simplify 15 questions about exemptions down to one - or none at all if you're over 18. To make these changes happen, we needed to make the case to our policy and operational stakeholders. We explained to them that by simplifying the exemption form, we were actually working with them to achieve their policy aims. By removing unnecessary complexity from the form, we reduce the risk of users mistakenly – or fraudulently – identifying themselves as exempt from IHS. This in turn reduces the volume of inaccurate applications that case workers have to deal with. Additionally, a service that's easier to understand reduces call volumes to contact centres. If we were to do this differently next time, we'd get involved earlier in the policy process. This would help us to understand the existing business processes better, giving us an opportunity to learn more about the needs of potentially exempt users.